The Kolb brothers, Emery and Ellsworth, set out to recreate Powell’s infamous trip in 1911, also beginning in the Green River in Wyoming and ending in the Gulf of California. Equipped with two custom wooden rowboats, the brothers set out on their [time frame] expedition. If not impressive enough, they also filmed a motion picture of their travels which was shown at their studio for a majority of Emery’s life. 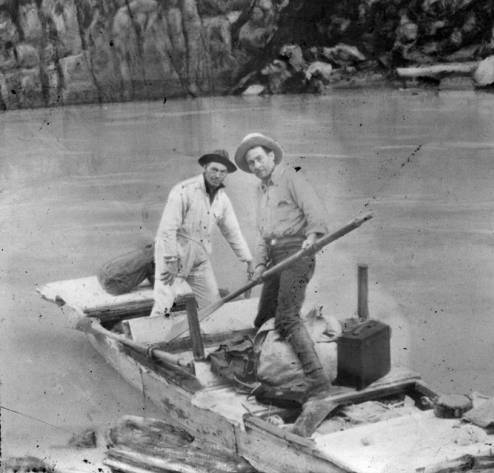 Kolb Brothers Unloading Their Boat at Spencer Canyon, after the Rescue Search for Bessie and Glen Hyde [image is reversed].